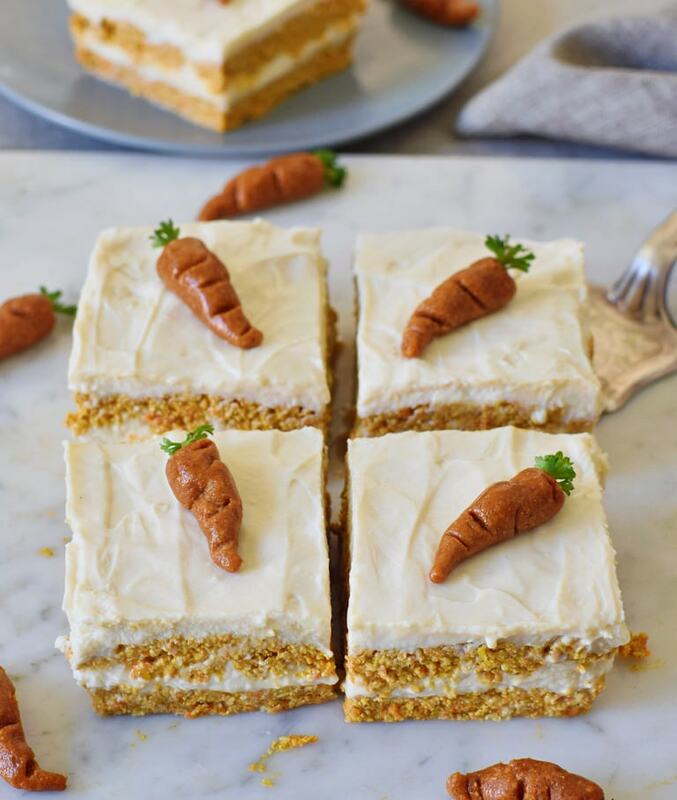 No-bake carrot cake which is vegan, gluten-free, and delicious! It’s a wonderful and healthy dessert for Easter but also tasty on any other day! Surprise your loved ones with this vegan carrot cake which will melt in your mouth! Happy Easter! I had to make another carrot cake because, in my opinion, it’s best to celebrate Easter with a deliciously moist carrot cake. 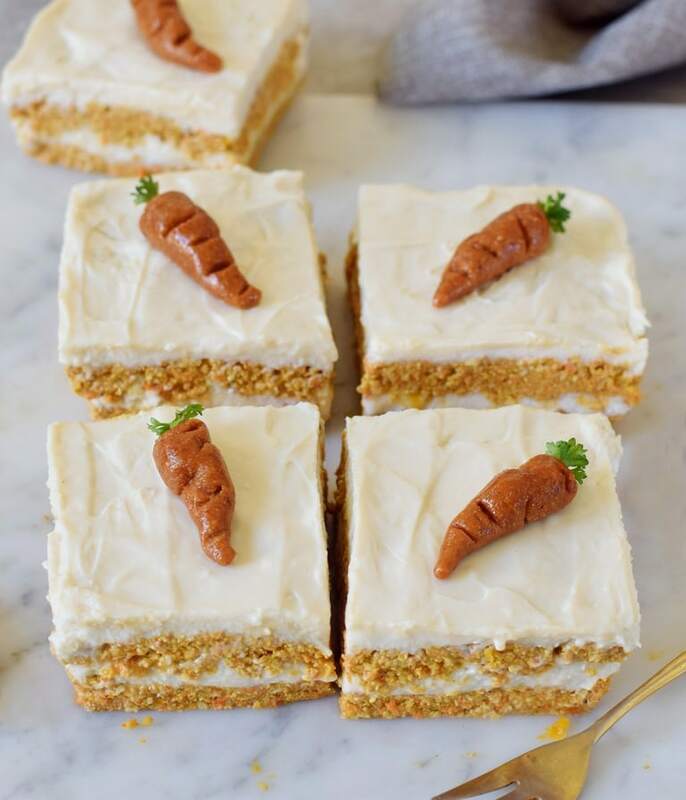 But this time I made no-bake carrot cake bars which are so creamy and healthy at the same time. They are easy to make and furthermore vegan, gluten-free and yummy. The recipe can be easily made refined sugar-free by using Xylitol, Erythritol or Stevia as a sweetener. 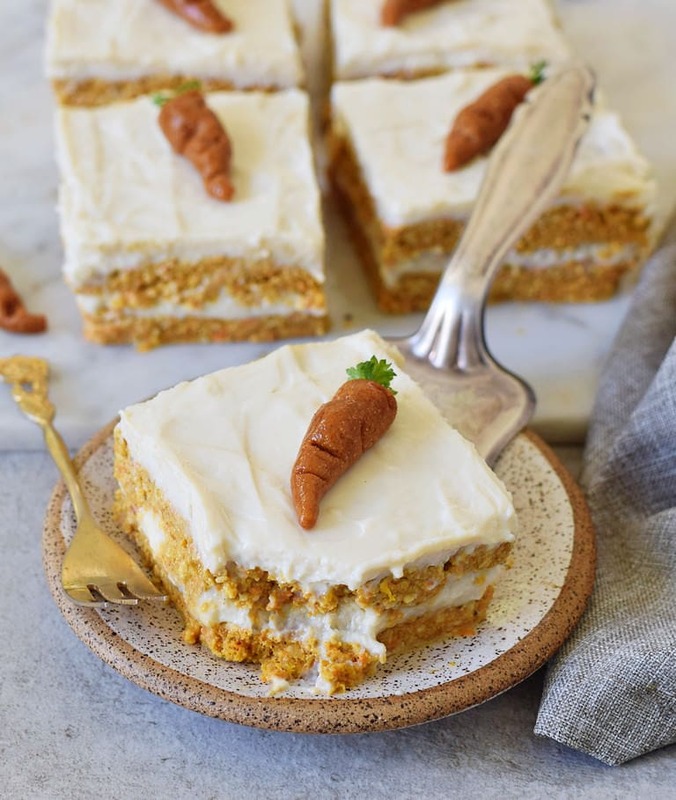 This no-bake carrot cake is great for breakfast because it contains lots of healthy fiber and carbs from oats, carrots, and dates. But the carrot cake also contains healthy fat and protein from nuts, which means you will stay full for a while. I also love to eat this vegan carrot cake as a delicious dessert in the afternoon. As I wrote before, this vegan no-bake carrot cake contains oats, dates, and carrots but I also added unsweetened shredded coconut, cashews, walnuts/pecans (or you can use seeds of choice e.g. pumpkin seeds, etc), coconut milk, a liquid sweetener, a tiny bit of cornstarch and flavorful spices. If you prefer a grain-free recipe you could use buckwheat flour, almond flour or coconut flour instead of oat flour, however, you will need to adjust the measurements. Coconut flour is very absorbent and dries out every dough, so definitely use less of it. For the liquid sweetener, you can choose between maple syrup, agave syrup, rice syrup or any other liquid sweetener of choice. If you can’t eat nuts, then you could make the cream layer with a (soy based) vegan cream cheese instead. 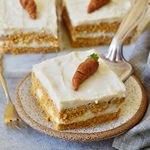 These no-bake carrot cake bars contain 2 1/2 cups of finely grated carrots. I am sure you know that carrots contain lots of beta-carotene which is a powerful antioxidant and very good for us. Isn’t it great to eat a delicious AND healthy dessert? 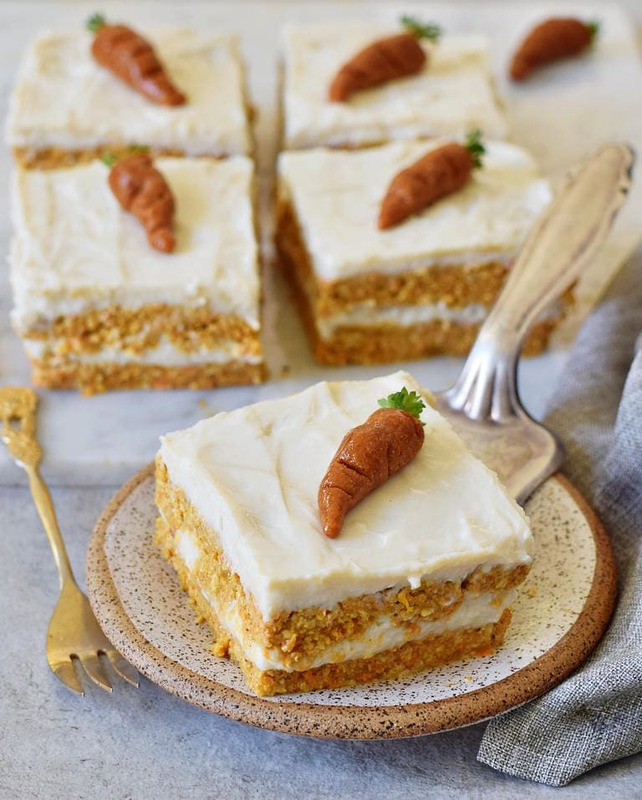 You can store leftovers of this vegan carrot cake in the fridge, there is no need to freeze the bars because they will stay firm and don’t melt. But you can, of course, also freeze them just make sure to let them thaw for about 20 minutes before you eat them. 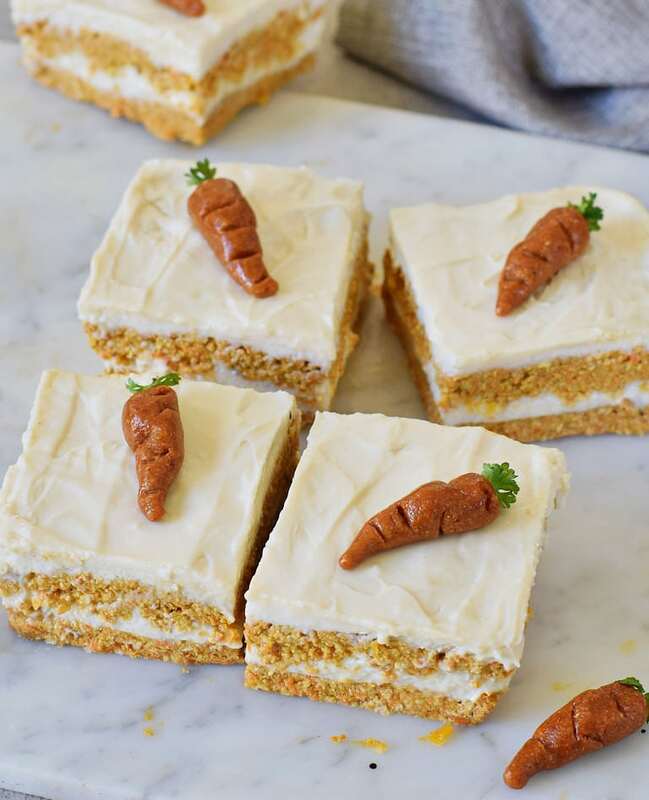 Please leave a comment below if you make these delicious no-bake carrot cake bars. You can also make a photo of it and post it on Instagram (or send me a DM). Please don’t forget to tag me in the caption + photo with @elavegan and use the hashtag #elavegan ! If you love vegan carrot cake as much as I do, then definitely also check out my baked carrot cake recipe. 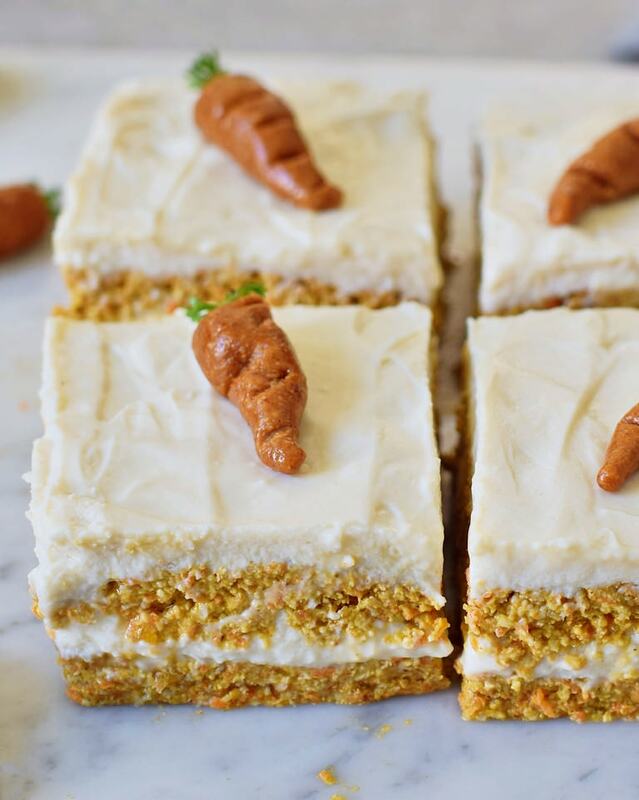 No-bake carrot cake bars recipe. This vegan carrot cake is great for breakfast or as a dessert. It's vegan, gluten-free, refined sugar-free, easy to make, and creamy. The bars contain healthy carbs, protein, and fat. A perfect recipe for Easter but tastes great on any other day! Soak cashews for at least two hours in water (better overnight). If you are in a hurry you could also boil them in water for about 15 minutes until they are soft. Start with the dough: Put the walnuts and unsweetened shredded coconut into your food processor and pulse for about 10 seconds. Add the oat flour and spices and pulse again. Next, add the carrots and dates and process until the ingredients are all combined. Don't overprocess, but the dough should stick together when you press it between your fingers. Line a 7x7 inch pan and press half of the dough into the pan (you can use a bigger pan but the bars will be less thick). Put the pan into your freezer. Now make the cream: First, you will need to combine the coconut milk, starch and granulated sweetener in a saucepan and bring the mixture to a boil. Let simmer for a minute until it's thick, like pudding. Set aside. Put the other ingredients for the cream into your food processor or high-speed blender, add the pudding, and mix until the cream is completely smooth. Depending on your mixer/food processor this might take a few minutes. Pour half of the cream onto the dough and put the pan back into the freezer for about 1 hour (or until the cream layer is quite firm). Then add the other half of the dough on top, press it down, and finally add the remaining cream on top. Put the pan back into the freezer for at least 2-3 hours (or overnight). Once you unmold the cake, let it thaw for a few minutes and cut it into 6-8 bars. 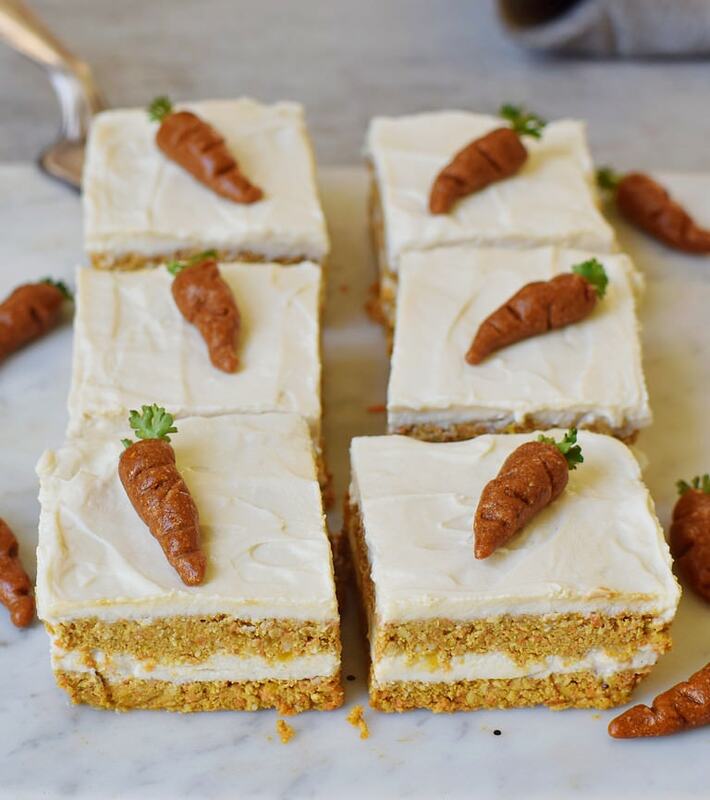 Enjoy your no-bake carrot cake bars thawed and store leftovers in the fridge! 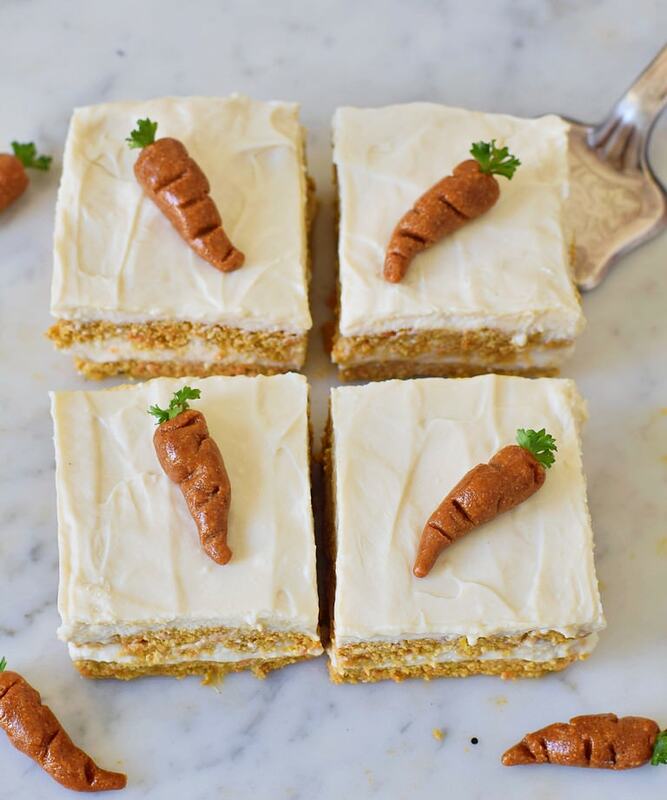 These carrot cake bars look super delicious! I absolutely adore baking with carrots ???? Thank you very much, Bianca! I hope you will give them a try ???? These bars look amazing Ela! Those little carrots on top are so cute! Wow! I just stumbled across your recipe. These look & sound amazing! I’m going to make them before the week is out.. I’ll let you know how I make out! Thank you for sharing!! What kind of starch did you use? I used coconut flour and it wasn’t wet enough. It was very powdery. But th floavor was really good. I followed the recipe with that exception. I don’t know what happened. Loved this no bake recipe ! Is there any alternate for coconut milk………? In India we don’t find it easily. I made them! They are delish. I wish I could post a pic here. I added a bit of oats as I was a little short on the flour. They are a fresh, healthy, yummy treat 🙂 Thank you! I am so glad you liked my recipe, Emily. 🙂 Thanks for your feedback! So cute! How did you make the little carrots? How sweet are these? I’m looking for new breakfast foods to try, but I don’t want them tasting too much like dessert. They aren’t too sweet. However, you can use less maple syrup (e.g. only 2-3 tbsp instead of 3-4 tbsp) for the cream. Delicious! I can’t have oats so, I subbed 2 cups coconut flour and 1/2 cup gluten free baking flour mix. I am reading this recipe and my mouth is watering! I will definitely try them out, and let you know how they came out! ???? I am not vegan, but you sure keep surprising me with vast ideas, and i teresting recipes! I have been following you on Instagram for a while now, even before I had the courage to start a blog myself! But you sure are an inspiration and hopefully you will visit my blog as well ☺️???? I’ll keep reading and trying out new ideas! ???????? These look absolutely delicious! Would I be able to store them in the freezer without any problems? Hey Friederike, for example, Xylitol, Erythritol, or regular sugar. You can also use coconut sugar as a granulated sweetener, I use it all the time and it works great! Thanks! Yes coconut works, soy is out! Thanks so much for sharing this Ela! I can’t wait to try it as I adore carrot cake! Love your page/blog too!